Hans NELSON (Alias Peter GUNNERIASSEN) was born Apr 11, 1838 in Norway, son of Sophia GRUNT and Zonnsen NELSON. On Jun 1, 1854 Hans entered the service of the Hudson’s Bay Company (HBC) as a laborer assigned to the Mackenzie River District. 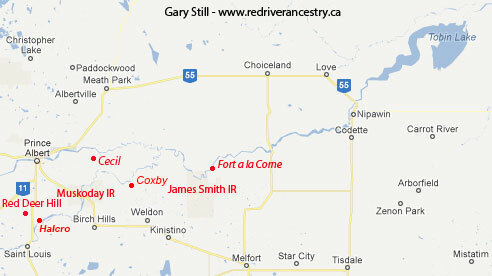 In 1856 his work base was at the Peel River Post (shown on map below). In 1858 Hans married Sophie BARBER in Fort Simpson. She was born about 1840 in an Indian Settlement, said to have been a member of the Dogrib Tribe (Dene First Nations people). From 1861 through to 1868 Hans is listed as a midman (voyageur; middle position in a canoe), laborer and fisherman, all out of the Peel River Post, with the exception of 1865-66 at La Pierre’s House (in Yukon, west of Fort McPherson). 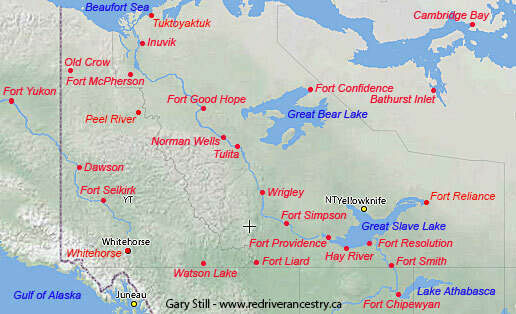 From 1868 until he retired in 1873 Hans was located at Fort Providence at the west end of Great Slave Lake. By about 1879-80 Hans and his family had settled in the Prince Albert District of Saskatchewan. By about 1879 eldest daughter Caroline married in Saskatchewan to John SAUNDERS (born 1851 in NWT), a member of the John Smith Band of Indians located SE of Prince Albert. 1885 was the year of the historic North-West Rebellion. Around 1890, according to a few sources, daughter Elizabeth married John ABRAHAM(S) (b-1861) and also married a Harold ROSS. So far unable to substantiate either of these marriages. There was a Harold ROSS who was captured by Gabriel DUMONT during the Battle at Duck Lake (North-West Rebellion). Census of 1891 in Red Deer Hill (south of PA): Hans NELSON, age 62; wife Sophie, age 50. Children: Christian (age 23), Albert 21), William (18), Annie (16), Edward (14) and James (10). Also John C NELSON, age 30 and his son Richard (age 3). In 1899 daughter Annie married William GARRISON in Prince Albert, son of Jane and Peter GARRISON (born 1845 in Scotland). Hans’ wife Barbara (nee BARBER) NELSON died before 1901. By about 1900 son Christian was married to Caroline PRUDEN, the daughter of Marie LANDRY and John Henry PRUDEN (b-1843). Census of 1901 in Prince Albert West: Hans NELSON, widowed, age 62. Children: Christian (age 32), his wife Caroline (age 20) and their son Edward John (age 2 months); Albert (31), William (29), James (20), Richard Jr. (age 12). William GARRISON, age 27 (born Mar, 1873); his wife Annie, age 25 (born Aug, 1875), and their son William Edward GARRISON, age 1 (born Feb 14, 1900). Around 1902 son James married Elizabeth ANDERSON in St Catherines (Prince Albert), daughter of Elizabeth KIPP and Robert ANDERSON (b-1843).